I’ve written in the past about the dangers farmers face in the work place, but according to new research, in addition to being one of the most dangerous professions, agricultural workers are also amongst the healthiest in the UK workforce. It’s not difficult to see why that could be the case of course, working outdoors, getting plenty of fresh air and exercise would be good for anyone. The survey, conducted by IronmongeryDirect found that workers in agriculture came third after Trades (construction/plumbing) and the Health and Fitness industry, with an average of four and a half hours of physical activity each day. Desk bound folk like myself and my journalist colleagues are of course way down the list and so we have to pro actively build movement into our working day or get out and about for a walk or gym session before and after the desk jobs. 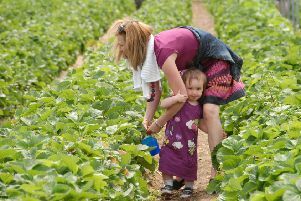 Another reason agricultural workers are healthier - according to this survey - is that they are less likely to succumb to sugary treats, as they are not in an office where cakes, sweets and biscuits are passed around on a very regular basis. Of course health and fitness can be measured in lots of ways, and many agricultural workers suffer from the effects of standing in milking parlours for years on end, or working in extreme weather conditions. But if we take the survey purely as an exercise in everyday fitness levels, then yes, farm workers are clearly more active than those of us bound to desks.